<a href="http://squarehaven.com/news/2007/07/09/ASH-info-unsealed/">ASH info unsealed</a><br/>Today Nintendo launched the official website of Mistwalker DS strategy game Archaic Sealed Heat. While no visuals beyond the logo appear on the page, the website offers a sample of the game's musical theme composed by Hitoshi Sakimoto. The DS strategy title will be developed by Mistwalker and published by Nintendo in Winter of 2007. Today Nintendo launched the official website of Mistwalker DS strategy game Archaic Sealed Heat. While no visuals beyond the logo appear on the page, the website offers a sample of the game's musical theme composed by Hitoshi Sakimoto. 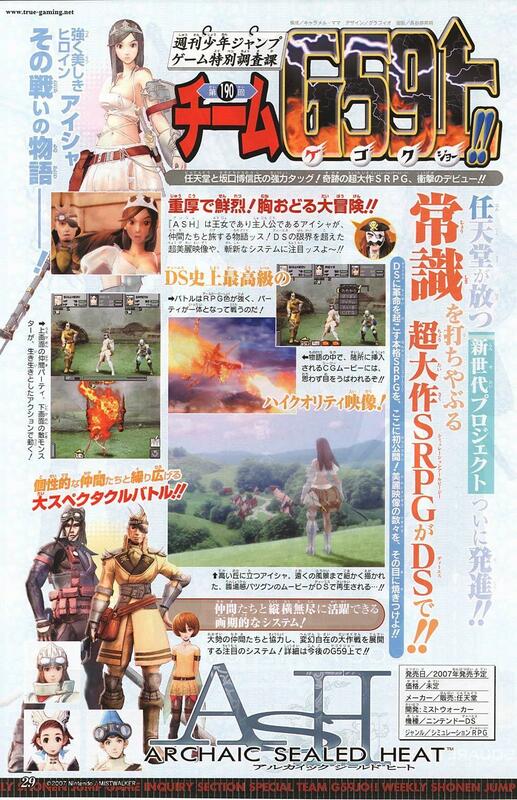 The DS strategy title will be developed by Mistwalker and published by Nintendo in Winter of 2007. Those who venture too close to the mystical flame called Archaic Sealed Heat are turned to ashes, only to be resurrected in a different form. Queen Aisha resolves to discover the secrets of the ancient flame, despite the perils involved in such an undertaking. Along with five party members with differing motivations, the 17 year-old monarch sets off to discover the secrets of the flame. The concept behind Archaic Sealed Heat has been in development by Mistwalker's Hironobu Sakaguchi for some time. Like the Lifestream of Final Fantasy VII or the Gaia Theory of The Spirits Within, the theme of reincarnation appears to be embedded in the game's mythos. While the title has been in development for some time, until recently details behind the development on the title have been kept tightly under wraps. The game is rumored to be reminiscent in design to the Playstation era collaboration between Sakaguchi's team at Square and the developers of Quest's Ogre Battle series, which produced Final Fantasy Tactics. Final Fantasy XII illustrator Hideo Minaba is responsible for the character art on the title, while Hitoshi Sakimoto is composing music. Archaic Sealed Heat is due out in Japan in the Winter of 2007. A North American release date has yet to be announced. Sakimoto enthusiasts might want to check out the Nintendo website for a sample of the game's musical theme.